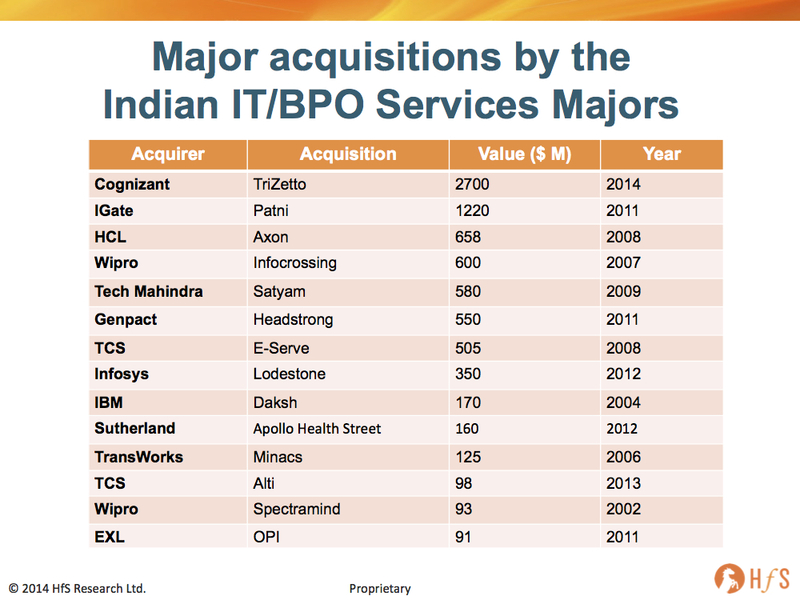 What ever happened to the days of the tiddly little sub-$10m "tuck-in" acquisitions that Indian providers used to make (and we all forgot about pretty quickly afterwards)? Well, the game has changed forever as Cognizant shelled out a whopping $2.7 Billion on healthcare technology firm TriZetto (read our research POV here). 1. Cognizant becomes a true BPaaS, software and services firm. Most of the pureplay services firms buy little technology tucks-in to improve their services, and have technology tools and platforms that differentiate them with proprietary workflow and IP. However, services firms have always sold services first and foremost, with software as the value differentiator that creates client stickiness and allows greater scalability of skills and standard processes. By acquiring a platform the size and scale of TriZetto, suddenly Cognizant is adapting to selling software, and not just service provision. 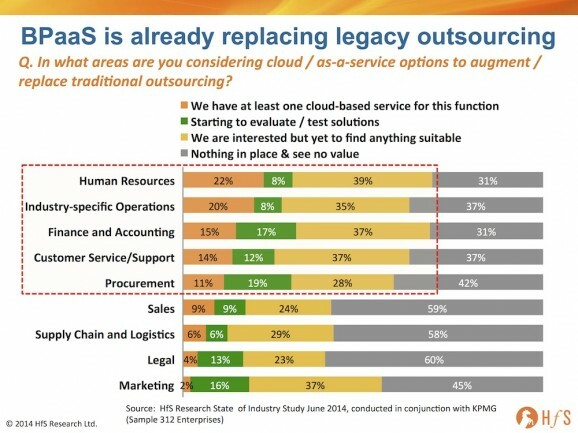 In my opinion, the only way true BPaaS will ultimately be successful is when the services firms elect to sell the software first and then figure out with the client how to implement it, redesign the processes, do the change management etc. I call this the "Workday effect". Essentially, have the client fall in love with the software, slam it in, then figure out the rest afterwards. It's like buying Google - they just force you to figure it all out after you've been bought into using their platform. Having a provider which understands - and can implement - a cloud platform, support the transformation and provide the necessary services that add real value to the front-office is the Holy Grail for many buyers. With half of today's outsourcing contracts potentially up for grabs, those providers with genuine platform plays are in pole position to pick off legacy outsourcing contracts that have hit the wall, in terms of finding future value. 3. Healthcare becomes the new "financial services" for IT/BPO. In the past, most of the big bucks in industry-specific IT/BPO was in sorting out the quagmire of complexity, dysfunction and legacy in the banking and financial services space. Now, with the ACA hitting us in full-force, it's plainly apparent that there's a ton of opportunity taking healthcare payers and providers into BPaaS and sophisticated outsourcing models. Watch this space for further acquisitive moves in this sector, where tech-centric healthcare suppliers, such as Emdeon and McKesson, are becoming increasingly attractive targets. You can just feel it in the air, can't you? The global economy's buzzing again, ambitious enterprises are willing to spend again. Meanwhile, the ITO labor arbitrage game is finally showing signs of drying up - and Cognizant, a major bell-weather for the health of offshore services, has responded with a massive, massive bet on the future of the industry - and few would dare to fault this move. Now the winners need to place their bets on the solutions and industries where they can find new growth opportunities - they all have serious funds available, and can likely get access to even more capital if they need to. There are clear yawning gaps in the market for (more) winning BPaaS offerings in areas such as finance and accounting, supply chain, retail and manufacturing... not to mention healthcare, life sciences and financial services. The future path for BPaaS is really starting to unravel and we'll likely know in the next 18 months who's willing to make the investments and business model changes needed to evolve with it. Brilliant piece Phil - and your exactly right in my opinion. 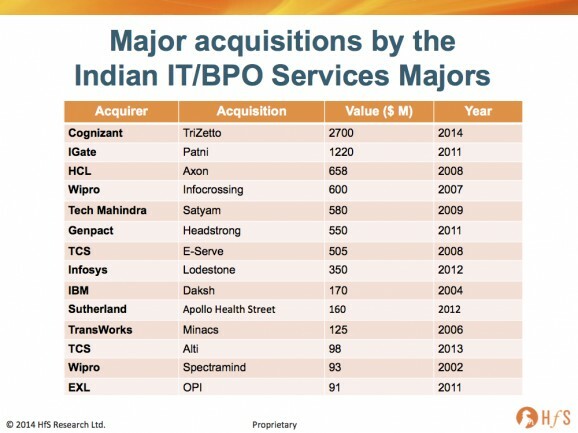 What other acquisitions do you think we can expect from Cognizant's competitors as a result of this? Phil - nice validation of Hfs' prediction of this trend some months ago. Curious to know how you see this BPaaS trend play out in P & C Insurance Industry. Hi Phil, I liked the comment"Healthcare is the new financial services". As BFSI has seen its peak and ACA driving transformative change in Healthcare. The time is right for biggies to focus on this vertical. Very interesting summary of the state of the industry, Phil. Thanks! An interesting interplay would be competition to traditional service providers from other players - e.g., payor organizations trying to look outwards to provide services to get off MLR limits on profitability, Optum being the benchmark. Other than ACOs and Kaiser like models there is also the possiblity of incremental vertical integration - e.g., payors acquiring revenue cycle intermediaries. All in all a very 'happening' industry vertical to be in. Completely agree with 1,2,3. Classic situation - a private business builds something over time identifying a niche model and that which scales represents a serious industry path forward. Something a big firm in the market will buy ! However regarding 4. Really ? Do any of the offshore firms have strategy herein and will they spend so much...apart from Infosys and the experience their Edge play/platforms represents, there is really not much visible yet. Tiny SaaS buys going nowhere. Perhaps Infosys has the potential to use their experiences and an early start with products to build out a mix of organic and acquisitions. Maybe even TCS. The point you make - get the software platform in first, make it sticky - that is fundamental. Problem is that a SaaS/BPAAS player who builds that stickiness and size is very expensive obviously. And the rest is very fragmented. DNA of the offshore players cannot handle that. Get the software platform in first, make it sticky – IMHO, this is not in line with the Q-on-Q revenue goals and hence gets shorted. Indian IT services industry is only just starting with Products and taking on more risks. Building great products FIRST is the next step!!! Sandeep - Services businesses that are at the first baby steps will be quickly overwhelmed by market forces. And good firms learn to balance both the short term quarter pressures and the longer term course correction. In a way that is what CTS is doing and IBM has been doing for a while. Products are ofcourse part of the picture. It is also about the integrated stack, the business specific processes and the analytics on top of that. All in the platform. And there will be scale BPaaS models platforms and botiques...strategically you got to select where you are headed/want to play and then invest to build this business. (Although I would imagine it makes sense to build out a portfolio of both). Historical positioning of these firms is offshore centric arbitrage. Which does not help much.